Photos of 60 ft Flat car and 57 ft Evans Coil Car on bridge to give you feel for the mass and size of the model. Please specify HO regular clearance or HI Clearance for those running heavy steam engines or modern HI Cube equipment. S&H added to final invoice. 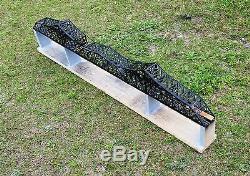 This is a great bridge for a club or large layout. A bridge theme is always a good theme to have for a layout as bridges are critical to our commerce. 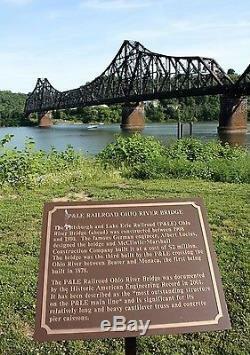 P&LE RR, Bridge at Beaver, PA. 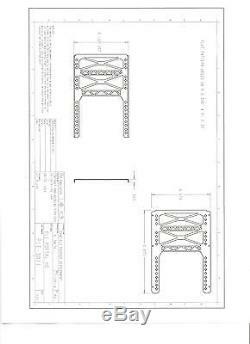 Implement line drawings, templates, CAD file to complete project. This model is a very large bridge! Esign, totaling 120 (10.0 feet). 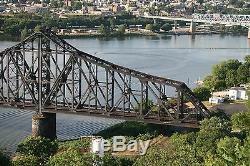 In length, including both approach anchor arches and center and for the main bridge. Listing will include three (3) sections as noted below. Length, 10.0 feet/ 120. Height, inner clearance for 3 1/2. Distance, length, between Anchor towers/piers 42. Bridge height from deck to highest point on superstructure = approx. 9" Bridge in photos height from waterline to top of tower approximately 18". 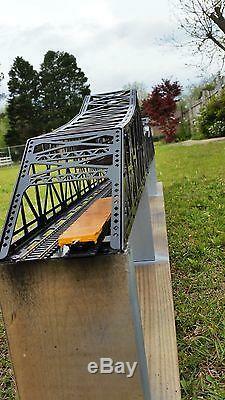 This bridge as a significant point of interest on your layout! Developing a number of historic and noteworthy "steel" bridg. Es to compliment my line of limited edition, signature series, stone, brick and concrete bridges, viaducts and structures. Always impressed with these engineering marvels. Icons of the Iron way. The P&LE was an interesting railroad. The "Little Giant" funneled massive amounts of raw materials into the Pittsburgh area and end products out to domestic and offshore locations. Neat railroad to model or base a generic railroad on the theme. Eeting regulator requirements for a. Of 2013, with 103 years service, t. Used in heavy daily revenue service on this busy CSX. An engineering marvel and an excellent candidate for my new series of limited edition, signature series bridges. My new "Steel Icons" line of " Signature Series" handcrafted replica models, will include this Cantilever design. HO , S & O gauge. These bridges, often taken for granted, large rivers and have played a major role providing a seamless rail transportation network in the United States. Today, after many decades of service, they are an intregal part of our transportation network. I have offered a line of architectural models, including bridges, viaducts, tunnel portals, retianing walls and structures found along the right of way s. Ince 1989' I originally started out building models replicating subjects I could not find in the market place. Goal is to offer several "Steel"models, intermediate to large designs, with good level of detail, a structure with sufficient size and detail, not exact, but close, capturing the character & mass of the prototype. Designs geared for the serious modeler. My goal is to capture the character and mass of the prototype while keeping model in range of the serious model railroad enthusiast. Model would be a significant point of interest for display or incorporated into your your home or club layout or diorama. Help me to access level of interest in producing this product. Model will be offered in. Completely assembled, ready for dispaly or incorporation into your club, home layout or diorama. Contact me as request special quote for assembly. Price affordable for the serious modeler or architecture fan. West of Mississippi and International orders by special quote. Sellers: Add a FREE map to your listings. 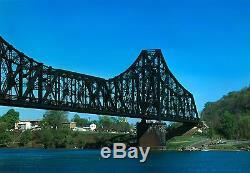 The item "P&LE Bridge, Beaver, PA, Cantilever design, HO gauge L. Assembled NEW" is in sale since Tuesday, December 1, 2015. This item is in the category "Collectibles\Transportation\Railroadiana & Trains\Other Railroadiana". The seller is "trains04nw" and is located in Kathleen, Georgia. This item can be shipped worldwide.